Tag Archive | "walking dead"
The Walking Dead to get post show talk show? AMC has announced that The Walking Dead’s season two premiere will be a ninety minute episode just as the series premiere was. I look forward to seeing where the story is headed and whether or not they will stick to the comic or continue to drift away from the great story line set for in the comic series. AMC’s critically acclaimed original series, The Walking Dead, is back with its much anticipated second 13 episode season. Kicking-off a two week long Fearfest, the network, once again, presents viewers with a 90-minute premiere episode, airing at 9 PM ET on Sunday, October 16th, with six one-hour episodes in the weeks following. The final six episodes of the season commences on Sunday, February 12th at 9pm ET. The 90 minute version is also scheduled to be launched globally on all Fox International Channels, following the US premiere the week of October 17th-23rd. Season two reaches FOX audiences in 122 countries, speaking 35 languages and is seen by over 200 million households globally. The Walking Dead follows a group of survivors, led by police officer Rick Grimes, played by Andrew Lincoln (Love Actually, Teachers, Strike Back), who are traveling in search of a safe and secure home. Jon Bernthal (The Pacific, The Ghost Writer) plays Shane Walsh, Rick’s sheriff’s department partner before the apocalypse, and Sarah Wayne Callies (Prison Break), is Rick’s wife, Lori Grimes. Additional cast include: Laurie Holden, Steven Yeun, Norman Reedus, Jeffrey DeMunn, Chandler Riggs, Iron E. Singleton and Melissa McBride. Recently announced guest stars include: Lauren Cohan, Scott Wilson and Pruitt Taylor Vince. The Walking Dead: Season 2 Spoilers! While chatting with AMC Frank Darabont talks about what’s in store for the second season of The Walking Dead. “I don’t know if we’re giving anything away, but something as simple in the comic books as ‘Lori gets pregnant’ winds up being sort of a fantastic complication on screen. In the story we’re telling, it’s just not that simple as it was in the comic book because you have those opportunities to really spin the story out in many different layers,” said Darabont. Be sure to check out the link below for more information about the next season of AMC’s new hit series, which is set to return later this fall. Are you in Atlanta? 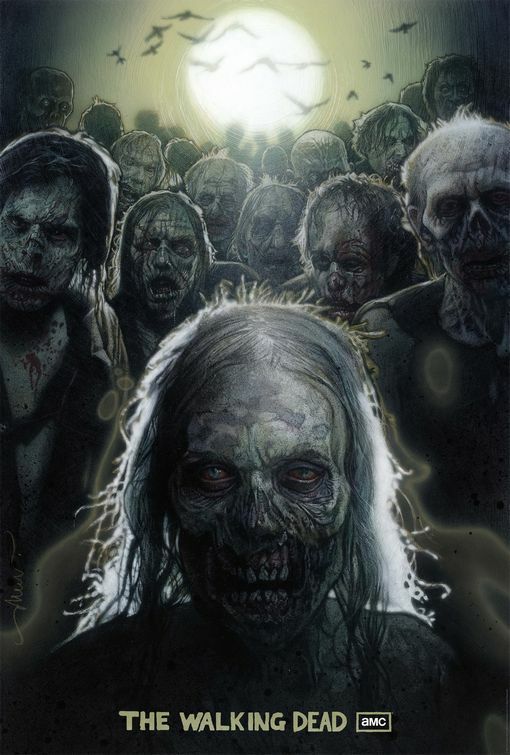 Would you like to be cast as a zombie for season 2 of “The Walking Dead”? Andrew Lincoln, who plays Rick Grimes on the hit AMC show The Walking Dead, chatted a little with Entertainment Weekly about season two. The Walking Dead is set to resume later this year. The below vid was released by AMC(via Movieweb) and features interviews with the show’s producers, as well as cast members such as Jon Bernthal, Jeffrey DeMunn and Sarah Wayne Callies.. There is no set date for the premier episode of season 2 as of yet, all we kno wis its around October 2011. More From Robert Kirkman On The Walking Dead! The Walking Dead Cast Discuss Season One Finale And Season Two Possibilities! The Producer of the show clears up the details surrounding the recent shake up of the writing staff. How They Trained The Zombies Of The Walking Dead! AMC Renews The Walking Dead For A Second Season! After rumors of a second season even before the release of the first one, it is now official. The Walking Dead will be getting a Second Season! Until recently, most Americans probably knew British actor Andrew Lincoln best as the bloke who wooed Keira Knightley with cue cards in the 2003 romantic comedy Love Actually. Now, though, he’s Rick Grimes, the southern-American, zombie-killing hero of AMC’s new smash hit The Walking Dead. We spoke with Lincoln recently about getting the role, the pressure of following AMC’s other protagonists, and that gross, gut-spilling scene in last night’s episode. So how did you get the part on The Walking Dead?